Starting at the foot of the Andes in Punta Arenas, Chile, and ending in the world’s southernmost city, Ushuaia, Argentina, this Patagonia cruise will take you through a mysterious region of unparalleled beauty and icy wonders. You’ll follow the path of legendary seafarers and explorers past the magnificent Tierra del Fuego National Park and Cape Horn, sailing through the awe-inspiring Glacier Alley, a row of glaciers each named for a different nation. Though you’ll enjoy most of the stunning scenery from the comfort of your cruise ship, you’ll also have several opportunities to step ashore and experience Patagonia and its glaciers up close. The most audacious can kayak their way up to the glaciers’ imposing edges. If you’re looking to add a bit of adventure to your Argentina vacation, a Patagonia cruise around the edge of the world is a one-in-a-lifetime opportunity. Note: This cruise is available from September 2012. Ask your travel advisor for more information. You’ll spend the day in Punta Arenas, depending on arrival date and time, until it is time to start your Patagonia cruise. You can check in anytime between 1 and 5 p.m.
At 6 p.m. you’ll board the ship to the greetings of the captain and crew. They will welcome you onboard with cocktails and you will settle into your comfortable cabin for the start of your Patagonia cruise. The ship will depart shortly after towards Ushuaia, city at the “end of the world”. You will cruise along the stunning sapphire waters of the Almirantazgo Sound until you reach the Marinelli Glacier in Ainsworth Bay. Here you will get a chance to step ashore and enjoy a hike through the lush forest. Keep an eye open for beavers and the local colony of giant elephant seals. After the hike, you’ll return to the boat to continue on your exciting journey. 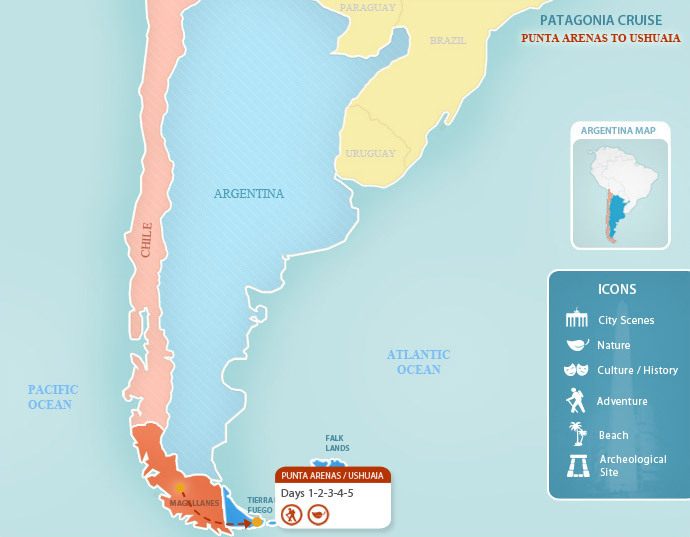 In the afternoon you will visit Tucker Islet where Magellanic penguins live. Note that the penguins migrate in April, so as an alternative, you may be able to visit Brookes Bay for a glacier hike instead. Today you’ll cruise through the main part of the Beagle Channel to reach Pia Bay, where you will disembark and be able to explore the majestic Pia Glacier on foot. Be sure to hike up to the lookout point for a spectacular view of the glacier stretching out into the mountains all the way to the sea. Return to the ship and relax as you travel through Glacier Alley, an impressive row of glaciers, each named for a different nation. Look out for the Spanish, German, Italian, French and Dutch glaciers. This morning you will sail through the Beagle and Murray Channels until you reach the Cape Horn National Park where you will disembark to explore the famous Cape Horn region via Hornos Island (depending on weather conditions). This legendary place is known as the “End of the Earth” and was declared a UNESCO World Biosphere Reserve in June 2005. Return to the boat and continue on your journey. In the afternoon, you’ll reach the Wulaia Bay, once the site of one of the region’s largest aboriginal settlements. You’ll disembark your ship again here and traipse through the forest of native vegetation such as Lengas, Coigües, Canelos, and ferns. You’ll be greatly rewarded for your efforts as you reach a spectacular lookout point before returning to the ship which will sail the last leg to Ushuaia in the night. You’ll reach Ushuaia, you final destination early in the morning and disembark your ship in this superb town. This is the southernmost city in the world, and your early arrival enables you to get a head start on visiting the city and the surrounding national park, Tierra del Fuego. Spend a few extra nights in Ushuaia and continue your South American adventures on another Argentina tour package, or catch your transfer to the airport for your return journey home.